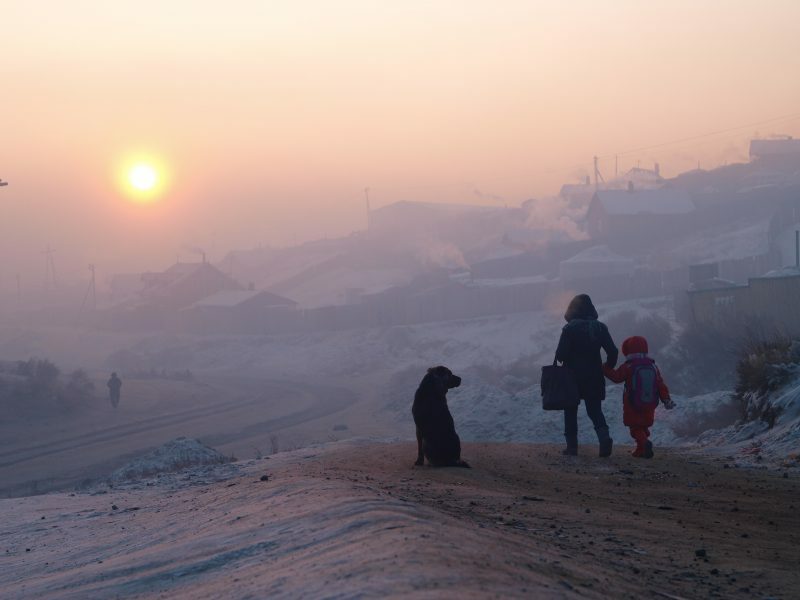 During wintertime, Mongolia’s capital Ulaanbaatar becomes one of the most polluted cities in the world, as thick smog from coal-burning power stations and stoves blankets the freezing streets. The health impacts are dire, and especially so for young children. Our partner organisation EPCRC met some Mongolian mothers to find out how they cope. But the days that Mongolians were born in a herder’s home with the smell of dung smoke have long since passed. Nowadays, most Mongolians are born with the acrid smell of coal smoke in their nostrils. When did we move from the dung smoke to the choking fumes of coal? Are we becoming forgetful from so much exposure to coal pollution? When did Ulaanbaatar, which was once known as the Asian White Angel, start hiding itself under a thick blanket of grey smoke? Even just hearing the word “winter”, my throat starts to hurt, and I start to worry about where to buy good air pollution masks. However, as this winter set in and the streets began to fill with smog, I started to wonder – what must this seasonal torture be like for mothers with babies and young children? What kind of worries must fill their minds, when they see their city start to resemble a smoke-filled warzone? To find some answers, we ran a poll in a mother’s group on Facebook asking what type of social problems air pollution brings to you and your family. The poll gave some surprising findings. The physical impacts of breathing such polluted air are relatively well known, but the poll showed that some of the biggest challenges that mothers face are mental health issues: worries and stresses over health and financial cost. It affects mental health both directly and indirectly: mothers who cannot leave the city feel helpless to protect their children from the pervasive smoke, and worry about the cost of medicines and preventatives. Some mothers flee the city every winter in order to save their children’s health, but face additional stress from losing their family relationships. 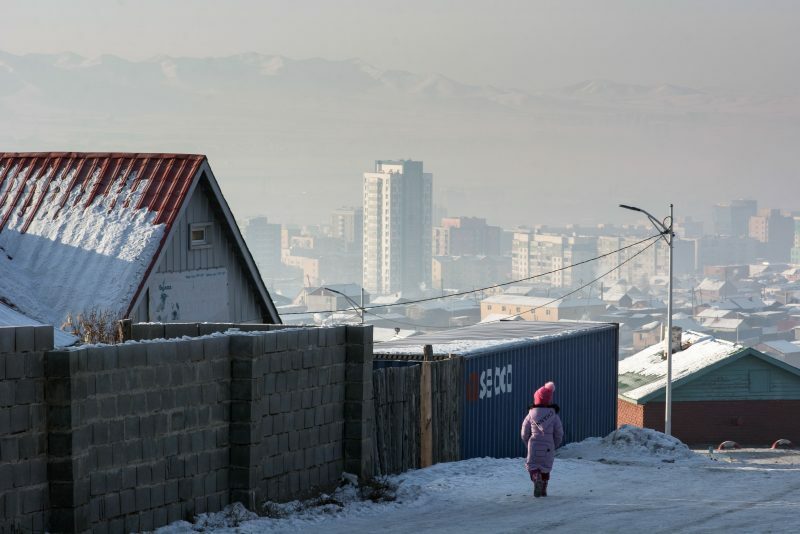 We wanted to better understand the mental health and financial issues caused by Ulaanbaatar’s air pollution. So we invited in two mothers for one-on-one interviews. The first is Gerel*, 25 years old, currently living in Ulaanbaatar with her 11 month old baby and her husband. She gave birth to her baby boy last December, escaping the city’s pollution to the countryside where her parents live. The second mother is Sarnai*, 35 years old, who lives with her husband and 3 kids and manages her own business. Sarnai also faced money worries brought on by Mongolia’s polluted air. “The best I can do is to keep the air in our home clean, take my kids out of the city on weekends and stay out of the city during summer holidays,” she said. Mothers in Ulaanbaatar have come together online to discuss their fears, but for Gerel it doesn’t always help. “I know that mothers share their stresses or worries on mothers’ groups on Facebook… the group that I am in now is very active. But my biggest fear is the screenshots on the posts that mothers make,” – like pictures of lungs turned black from coal dust. Sometimes, it feels like our city is under the spell of a furious dragon, spewing smoke and ash. But if air pollution is the dragon, the question becomes - who will defeat this monster? Should we sit and wait for a “hero” with a big muscular body, a sharp wit, and a lightning-fast horse to save us? Or should we try to find a way by ourselves? In the late 19thand early 20th century, London was notorious for its thick smog. Caused by the mass burning of coal for power and heat, the smog reached disastrous levels in December 1952, killing up to 12,0001 people and hospitalizing thousands more. In response to public pressure, the “Clean Air Act” was passed in 1956, forcing homes and businesses to reduce coal use and accelerating the uptake of clean fuels. By 1980, air pollution in London had fallen by 80%. The city of London was saved by social movement, scientific pressure, effective government policies, and the cooperation of civilians and government. But who is going to save Ulaanbaatar? Air pollution is a complex problem which demands everyone’s participation. The pollution will not disappear by just clicking a button. Should we just sit by and wait for a hero? Or should we become heroes of our own?